Use TB3J6KY to reference this item. To serve as a reminder of what we are doing and why we are doing it, this award will go to most CITO events if I remember it! 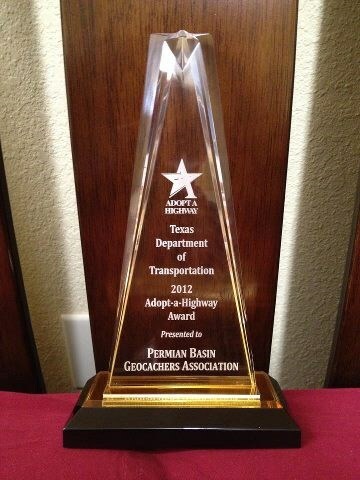 This award was given to the Permain Basin Cachers Association for their efforts with the Adopt a Highway program by the State of Texas! 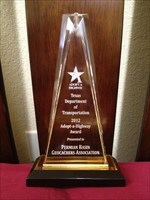 This award was given upon the groups first year cleaning the highway. Not sure of discovery date, just catching up today... TFTD.. Thanks for showing me this cool award sknight! Discovered at "Hold on a second - The Event". Thanks for sharing! I discovered this great tag at the Unnamed Event in Lake Sommerville, Tx. Congratulations on this awesome award! Discovered during the UnNamed Event.